An Incomplete Revenge by Jacqueline Winspear, a Mysterious Review. 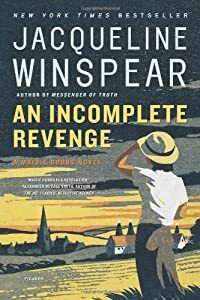 Review: Private investigator Maisie Dobbs travels from London to Kent to do some background work for a client pending his purchase of a commercial property in An Incomplete Revenge, the fifth mystery in this series by Jacqueline Winspear. Maisie is grateful she has been retained on for an assignment during the economic slowdown of the early 1930s in England. Corporate executive James Compton wishes to purchase a brickworks in southern England but is concerned that some petty crime and unexplained arson in the area will make the decision difficult to justify to his backers. He hires Maisie to look into the matter. Once there, she quickly ascertains the source of the crime but is puzzled by the fires that seem to occur every year on or about the anniversary of a Zeppelin bomb that destroyed a home in the village. Her questions are met with steely silence by the villagers, but her persistence eventually causes the truth to come to light. An Incomplete Revenge is unquestionably a beautifully written and meticulously (if weakly) plotted novel. The Kent countryside of England is richly drawn and the characters of this period interesting and fully developed. The narrative is descriptive, atmospheric, and poetic, at times lyrical. Yet the story moves along so slowly and there seems to be so little progress made in Maisie's investigation for long periods of time that it loses much of its potential to fully capture the readers imagination. And then there's the parallel story of Maisie's relationship with the local gypsies. Though the supernatural elements are rather overdone, there's a hint of intrigue here that remains unresolved at the end of the book. Maybe it will return in a later story. Some of the inactivity in the story can be attributed to the continued development of Maisie's character. Maisie ranks among the most captivating in modern detective fiction and it's fascinating to watch her grow and adapt. Her personal loss and how she reacts to it seem very real. The relationship she has with her father is really quite special. But it's fairly clear very early on who is behind the thefts and it doesn't seem to be much of a secret who's behind the annual fires, so one is left with a somewhat anti-climatic conclusion and a bit of disappointment that there wasn't more to it all. As a novel, or maybe an investigative effort, An Incomplete Revenge is outstanding. As a mystery, less so. Still, it's always a treat to read a Maisie Dobbs investigation, and this is no exception. Acknowledgment: FSB Associates provided a copy of An Incomplete Revenge for this review.